If other members of this group are anything to go by, it will be found living in and around pieces of driftwood in flowing parts of rivers and streams. 48″ x 18″ x 18″ (120cm x 45cm x 45cm) – 243 litres. A spacious tank is required, preferably with a sandy substrate. Provide hiding places in the form of some big chunks of driftwood (also essential in the diet of the fish, see below), and preferably dim lighting. Aquatic plants are not a feature of its natural waters and would most likely be eaten anyway. Some surface vegetation, however, is not a bad idea. It also needs well-oxygenated water, ideally with a good amount of movement and flow. Primarily a xylophagus (wood-eating) species and will not do well without access to wood as a food source. In scientific studies, the intestines of the fish have found to be completely filled with wood chips and the fish have specialised bacteria in the gut that help with the digestion of it. It also enjoys munching on greenery such as cucumber, courgette, blanched spinach etc. and will also accept sinking dried foods. An amicable species that can be kept with a variety of tankmates provided its oxygen requirements are met. Larger characins, cyprinids, peaceful cichlids and other catfish would all be suitable. It’s surprisingly non-territorial and can be kept both in a species group or other peaceful Loricariids. Bear in mind that smaller species may be intimidated by its size. Not known to have been bred in the hobby. This undescribed species is part of the Hypostomus cochliodon complex, all of which were previously included in the genus Cochliodon. This is now considered a synonym of Hypostomus. 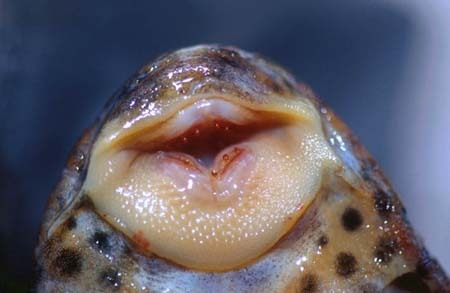 Members of this group can be distinguished from congeners by several differences in morphology, most notably the hump-backed profile of mature fish and spoon-shaped dentition. These features, along with the fishes tendency to eat wood, are shared with the Panaque genus of the Ancistrinae subfamily, but the two genera are known to have evolved convergently (independently) of one another. 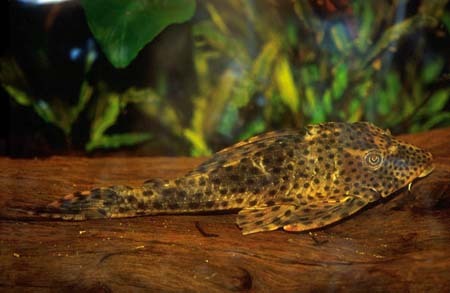 It’s thought that the wood-eating behaviour of the fish has developed as they inhabit areas where fallen wood litters much of the substrate. Not much light penetrates the water to initiate algal growth, giving fish with the ability to use wood as a food source a competitive advantage. It’s certainly an impressive specialisation, as these Loricariids are the only species of xylophagus fish known. When buying Loricariids such as this, always check the fish has a rounded belly and that its eyes aren’t sunken, as these are classic signs of emaciation in newly imported specimens. Care should also be taken when netting the fish, as the pectoral odontotes of males can easily become caught in the mesh of aquarium nets.